The RAF Cosford Air Show 2014 generated over £1.5 million worth of business in the West Midlands economy, a figure which is expected to be exceeded for the 2015 air show, planned for Sunday 14th June. The air show weekend sees increased sales at various local businesses such as petrol stations, shops and restaurants. Local hotels and B&Bs also feel the effects, with many being fully booked for the show weekend months in advance. In the last two years alone, the air show has raised over £500,000 which has been donated to local and RAF charities. Other benefits for local businesses include the sponsorship, advertising and exhibition opportunities at the RAF Cosford Air Show. 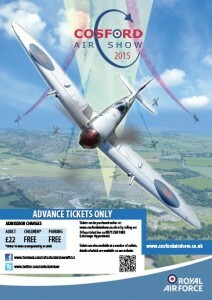 With an affluent audience of 55,000 the air show presents a perfect opportunity to engage with customers. The Air Show also provides a unique setting for corporate hospitality with a number of different packages available. For those who want to enjoy the event in style, the Trenchard Enclosure benefits include VIP parking, all-inclusive bar, high quality catering and a prime viewing location for the flying displays. There are options such as the Whittle Enclosure or the Cosford Club for those seeking a more informal day out. Tickets for the RAF Cosford Air Show 2015 are on sale, priced at £22 and with free entry for accompanied under-16s. This year tickets will only be available in advance in an effort to improve traffic flow and access into the site. Parking for the event is free and car parking capacity has also been increased for 2015. NextAIRSHOW NEWS: RAFA Shoreham Airshow wins ‘Best Community Event Award’ for the 2014 Event!